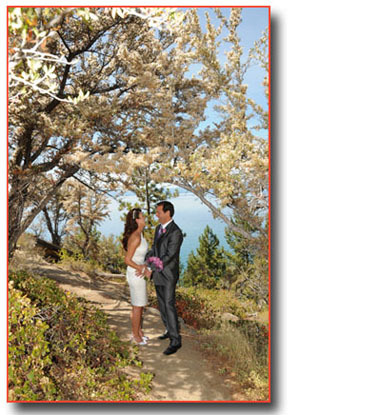 With the approximate 300 feet high overlook of Lake Tahoe, the vista point at Logan Shoals makes a great Nevada wedding site for the bride and groom who want to marry in a beautiful and secluded outdoor venue. Vista Point’s magnificent views are stunning, and when conditions are right the alpenglow sunsets create a romantic wedding atmosphere for those couples desiring a sunset ceremony. Located off Highway 50 on the east shore of Tahoe about twelve miles from the Stateline casinos, Logan Shoals remains hidden away and unknown to many visitors, making it a secreted jewel because it’s a perfect setting for a wedding. Possessing similar characteristics to Emerald Bay, the vista point is a great alternative. However, since this venue resides in Nevada, a Nevada marriage license is required. In conjunction with abounding splendor, Logan Shoals emanates an ambiance of intimacy that’s particularly ideal for small groups. Weddings are performed year-round at this location, and formal to informal dress is very fitting. Want a simpler package at Logan Shoals? Our Simple and Sweet Ceremony is an option! 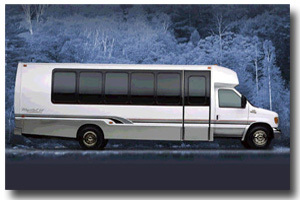 As part of our wedding services, we offer limo coach shuttle services for the bride and groom and all their guests to and from the wedding site. 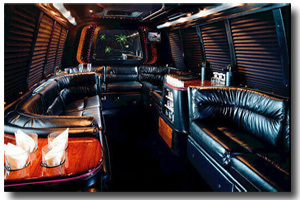 Ride in comfort and style on the most important day of your life with the added assurance that all of your guests will arrive together and on time. Once aboard, you’ll enjoy comfortable seating for up to 18 people, iPod hookups, a stereo system, DVD player, and complimentary cocktails. After the ceremony, your private coach will transport you and your party to the reception facility, all at a cost that’s only slightly more than traditional limousine services.